New iMAPCAL for iOS devices has been released to support MAPCAL3 V3.5 firmware. Display and log RPM, Boost, TPS, Ignition Timing, Wideband AFR’s, Ethanol %, Ethanol Temperature, Inlet Air Temperature, Exhaust Gas Temperature and Coolant Temperature. MAPCAL3 V3.5 is a major upgrade from V3.4 with the following new features. Support Native GM(tm) Fuel Composition Sensor Support for Ethanol contents from 0% to 100% (KVF Input). 2D Compensation tables for Fuel, Ignition Timing and Auxiliary Injector Output based on Ethanol content. 2D Ethanol fuel temperature compensation for Fuel and Ignition timing (optional adapter required to collect fuel temperature data). Compensations A complete overhaul of the fuel, barometric pressure and now coolant temperature compensations. 2D IAT Fuel and Ignition Timing compensation table 2D Barometric Fuel compensation table 2D Coolant Temperature (CLT) cold start compensation table New Features RPM Limiter function separate from Launch Control. Boost Cut function uses the Launch Control function to cut ignition to limit boost. Launch Control only retards ignition timing when target RPM is reached. Launch Control Anti-Lag solenoid output function. Exhaust Gas Temperature (EGT) input for logging. Coolant Temperature (CLT) input for logging. 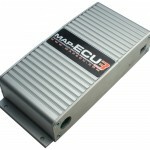 You can configure which tables MAPCAL3 reads and writes to the MAPECU3 to speed connecting and tuning. For example, if you are not using the secondary tables, they can be disabled.